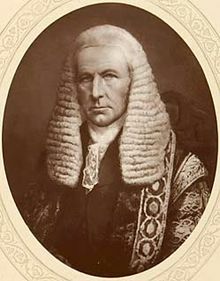 Speaker Denison's rule is a constitutional convention established by John Evelyn Denison, who was Speaker of the British House of Commons from 1857 to 1872, regarding how the Speaker decides on their casting vote in the event of a tie in the number of votes cast in a division. The thinking behind the rule is that change should only occur if an actual majority vote is in favour of the change. Speaker Denison's rule is now a guiding principle in many other bodies that have neutral chairpersons. There was believed to be a 317–317 vote on an amendment to a motion concerning the Maastricht Treaty on 22 July 1993, but it was quickly discovered that one extra "Aye" vote had been erroneously counted. Prior to the counting error having been noted, Speaker Betty Boothroyd did give a casting vote of "No", although this was later expunged when the error became clear. ^ MacDonagh, Michael (1914). The Speaker of the House. London: Methuen. p. 74. ^ Factsheet P9: Divisions (PDF). London: House of Commons Information Office. 2010. p. 6. ^ "Exercise of the Casting Vote of the Chair". Parliament of New South Wales. ^ "Brexit: Bercow uses casting vote after first Commons tie in 26 years to block backbench indicative votes - live news". The Guardian. 3 April 2019. ^ "Business of the House". Hansard - Parliament UK. ^ "Treaty of Maastricht (Social Protocol)". Hansard - Parliament UK. ^ "Amendment Of Law Relating To Termination Of Pregnancy". Hansard - Parliament UK. ^ "Televising Of Parliament". Hansard - Parliament UK. ^ "Scotland Bill". Hansard - Parliament UK. ^ "Aircraft And Shipbuilding Industries Bill". Hansard - Parliament UK. ^ "Points of Order - 23 July 1993". Hansard - Parliament UK. ^ "House of Commons: Tied Divisions". United Kingdom Election Results. David Boothroyd. Archived from the original on 5 January 2008. Retrieved 23 June 2009.